With budget cuts and arts funding slashed everywhere, we keep hearing questions about what exactly the arts (and especially theater) are worth in the scheme of things. 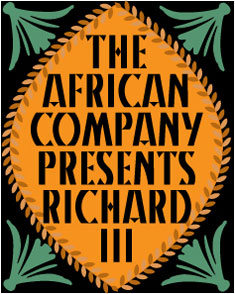 Carlyle Brown's "The African Company Presents Richard III" provides a dandy answer to that question. In Brown's play, the ability and the wherewithal to create - even just the right to watch theater - offer hope, pride, imagination and identity. Waiters, housemaids and former slaves can play kings and queens on stage. Waiters, housemaids and former slaves can watch people just like them playing kings and queens. Pretty powerful stuff. "The African Company Presents Richard III" also portrays a slice of little-known African American history, just in time for Black History Month. In 1821, with America less than 50 years old as a country, an all-black theatrical enterprise called the African Company began playing their version of Shakespeare's "Richard III" in New York City. Their performances became a hot ticket, so hot that white people started coming, too, and they had to erect a partition to separate the white people at the back of the theater. But then another theater, a fancier, wealthier, much whiter theater, announced that it was bringing the famous Junius Brutus Booth over from England to play Richard III. And it just wouldn't do to have a fledgling black company offering the same play across town. Especially not Shakespeare. So the powerful producer at the white company put money in the right hands, pushed where he needed to push, and got the African Company closed down. Temporarily. It's a fascinating story, about who has the right to perform Shakespeare, but also about who in America has the right to aspire, to dream, to be somebody or go somewhere. Director Robert Ramirez and his cast from the University of Illinois Department of Theatre do a fine job of telling that story, giving it passion and intelligence, beauty and sorrow. Brown's best scenes are the ones where we see exactly how and why Shakespeare and his language mean so much to these actors, including a compelling jail scene at the end that almost works as an epilogue, and Ramirez's cast definitely does those scenes justice. Julian Parker, who plays the African Company's leading man, James Hewlett, and Kalyn N. C. Rivers, who plays Hewlett's romantic interest on and off the stage, share a crackling rehearsal scene with several levels of tension, Mark West gives the company's producer, Billy Brown, excellent fire and presence, Deandria Janice Kelley is fun as the no-nonsense maid who delights in playing a queen, and René Thornton Jr. makes the eccentric Papa Shakespeare the heart and soul of the African Company. Ethan Gardner adds an Irish Brogue to the mix of accents (all on target) and a menacing sneer to fuel his corrupt Constable. Jennifer R. Anderson's scenic design transforms Krannert Center's Studio Theatre into a cozy playing space, with velvet curtains on the sides, a proscenium arch and a small raked stage to suggest theatricality and history, while Sound Designer Robert Dagit adds the atmospheric echo of a hundred empty old theaters to really sell the setting. This time of year, it may be a trek to get to "The African Company Presents Richard III," but it's well worth the journey. Cast: Julian Parker, Kalyn N. C. Rivers, Mark West, Deandria Janice Kelley, René Thornton Jr., Doug West, Ethan Gardner, Monica Lopez, Charlie Lubeck. Remaining Performances: February 8-12 at 7:30 p.m. and February 13 at 3 p.m.. This review originally ran in the Champaign News-Gazette on February 6, 2011.